AGUAPURO offers the State-of-the-Art Packaged Reverse Osmosis Systems complete with Pre & Post Treatment equipment offering Very Pure Water from Brackish or Saline water. AGUAPURO carries complete range Reverse Osmosis Plant. Units ranging from 100 to 10000 LPH and more. 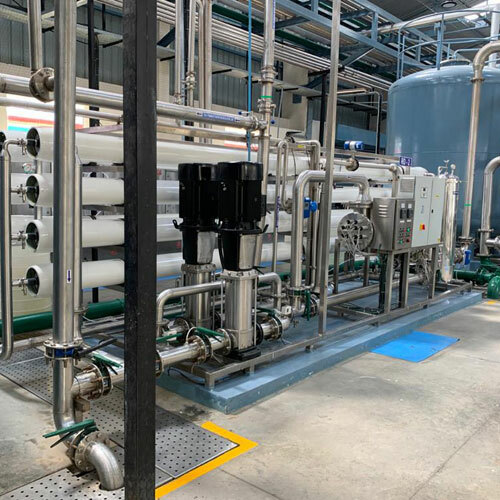 Our Standard features of reverse osmosis plant includes Pre Micron Filter, High Pressure Pump, Stainless Steel Pressure tubes with Membranes, Electrical Control Panel with TDS meter and Wet Panel with Flow Indicators and Pressure Gauges, pressure switch and electrically driven solenoid valve, Pressure Regulator valve, Stainless steel 304 frame (Skid) etc. These systems are used for water having TDS up to 2000 ppm. These systems are used for water having TDS up to 2000 ppm. Optional features include Membrane cleaning system, Level switches, Low Pressure cut off switch, Automatic Fast rinse flush, Low pressure safety cut-off switch etc. Our modular design allows for a wide range of flow rate ranging from 100 LPH to 10000 LPH. Larger flows also handled with custom made designs. Systems are designed using the State-of-the-art Reverse Osmosis Computer Software. we offer wide variety of products used in Industrial RO System such as portable water generation, Brackish water, sea water desalination and effluent recycling etc. We bring a combination of RO & UF system for power plant, pharmaceutical & high quality process water. Neutech offers wide range of packaged drinking water system ( mineral water plant ). For large scale plant complete turnkey solutions offers. We are deal in Hyundai RO System. Aguapuro is a renowned firm which is involved in commitment to quality, we are manufacturing and supplying quality-approved Fluoride Removal Filter. This filter is fitted with set of frontal valve & pipe work. High quality material, which is sourced from certified vendors of market is used in the manufacturing process of the offered range of filters. AGUAPURO Offers a Specialized System to recover water from the Reject Stream of RO. This system includes Filtration Membranes followed by Reverse Osmosis Unit to recover water from Reject Water to reduce water Wastage. Water Conservation is an Important Way to confront The drought. to recover RO Reject water is one of the water conservation which can be successfully handled by AGUAPURO. The capacity of the plants are ranging from 200 Lts per hour up to any capacity.